Vulnerable communities in Behara, in drought-hit southern Madagascar, participate in a food for assets programme funded by the European Union. Leading food agencies of the United Nations warned that 46 per cent of the population from eight regions of Madagascar, comprising of 1.9 million people are food insecure, including 450,000 people who face chronic food insecurity. The UN agencies also announced deliverance of a number of programmes in the country with an aim to eliminate hunger, improve nutrition, promote sustainable agriculture and contribute to achieving Sustainable Development Goal Two of the recently adopted Agenda 2030. According to the Crop and Security Assessment Mission (CFSAM), an assessment by the Government of Madagascar, Food and Agriculture Organization (FAO) and World Food Programme (WFP), the highest food insecurity rates are found in the island's drought-hit southern regions of Androy, Anosy and Atsimo Andrefana where 380,000 people, totalling 30 per cent of the population are severely affected. “The current situation requires real action from a range of actors to help vulnerable people recover and to avert a deterioration in the food security situation,” said Patrice Talla Takoukam, FAO Representative in Madagascar in a press release, adding that the recent food security assessments have not of themselves been sufficient to address the crisis. The UN agencies said that a significant decrease in food production during the past three agricultural seasons due to recurrent shortage of rainfall has been the causes for food insecurity in the region. They also reported that many households are resorting to negative coping strategies, such as sale of assets, reducing their number of daily meals, withdrawing children from school and consuming wild foods such as cactus fruit. “When households adopt negative coping strategies, their resilience to shocks decreases,” said WFP Country Director Willem Van Milink. “Continuing assistance is crucial not only for communities to have adequate food consumption during the lean season but also so they can regain their livelihoods and increase their resilience to shocks,” he added. 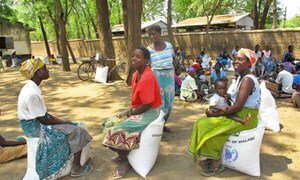 WFP said that they will be assisting 130,000 of the most vulnerable people in five districts through food- or cash-for-assets programmes, starting from November and continuing until the next harvest which is due in February. Such programmes are designed to help communities to build resilience and prepare for the next harvest season. The UN agency also said that the households that unable to work will be supported through food distributions. To treat and prevent malnutrition, WFP has said that it will provide supplementary feeding to pregnant women, nursing mothers and to children less than two years of age. FAO said that they have distributed improved drought-resistant seeds as an emergency response measure in the agricultural sector. The seeds will help in replanting of more than 6,000 hectares of land and helps ensure food availability for 13,000 households in Anosy and Androy regions, said the UN agency. FAO also reported that crops and pasture in 2013 and early 2014 were affected by a plague of crops which has now been eradicated with support from the Malagasy Government and donors under a three year locust eradication programme. WFP said it has supported national efforts to treat moderate acute malnutrition among 7,000 children. The agency also said that in early October, a WFP-chartered plane airlifted a nutritional supplement to Madagascar’s capital Antananarivo. This, the agency said, will be used in state-run nutrition centres to fight increasing levels of acute and moderate malnutrition among children aged less than five years old, in the south of the country.